Appliances — Dentistry 4 Kids Adults and Orthodontics Too! We offer several types of appliances to address a variety of concerns. 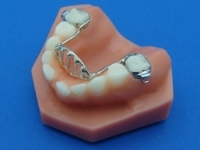 Dental appliances are commonly used for orthodontic correction, improving appearance, and prevention. Dr Jones has been a proponent of early orthodontic intervention for over 30 years. She believes that dental treatment coordinated with orthodontic development results in the most amazing smile possible. Baby teeth aren't only for chewing, they are essential for holding space for the permanent teeth. Early loss of a primary tooth due to trauma or decay creates an empty space that the permanent tooth will eventually occupy. Sometimes a space maintainer is needed to "reserve" the spot until eruption. The small metal appliance is cemented to the adjoining tooth until eruption occurs, then painlessly removed. Failure to maintain space can result in crowding, impacted teeth, misalignment of the upper and lower jaws, and more. Our doctors will evaluate each case to determine if a space maintainer is needed. Children begin sucking their thumb or finger from a very young age, some even start inside the womb. According to the American Dental Association, most children stop thumb sucking on their own between 2 and 4 years old by simply outgrowing it. However, if your child is still sucking when his permanent teeth start to erupt, you will want to actively work on stopping. Another common oral habit is tongue-thrusting. This is the act of pushing the tongue against the front teeth when swallowing or resting. This can affect speech in addition to appearance. Consistent pressure from thumb or tongue can eventually alter the shape of the face and the position of the teeth. When recommended, habit appliances provide an effective solution. Years ago, parents were told to wait for all the permanent teeth to erupt to see if their child needed braces. More recently, orthodontists started to recommend phase 1 treatment as early as 8 yrs old. Today, insightful pediatric dentists like Dr Jones have a new approach. Factors such as jaw size can indicate the potential for crowding from a very early age. In some cases, we can create a customized plan for early intervention and avoid future orthodontic issues. We offer appliances to widen the entire arch, or to guide a single tooth. Intentional and timely extractions of primary teeth can also influence the position of erupting teeth. Future orthodontics, if needed, are much easier and less expensive. This is another example of our dedication to long term, individualized dental care for our patients.